We were all looking forward to the fall colors on the Pine, and it did not disappoint. 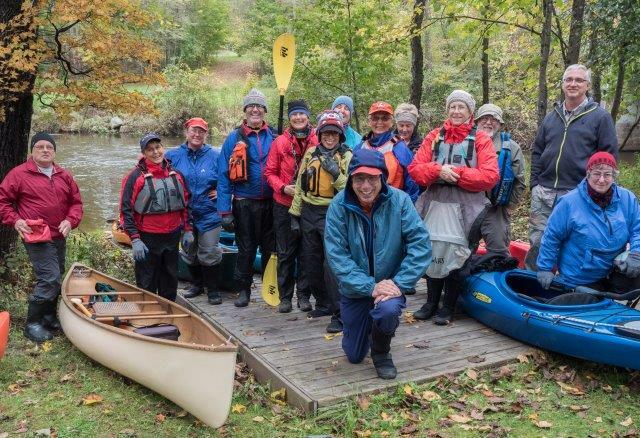 The group was large, but everyone had lots of experience, so we all stayed dry (minus a few wet feet). 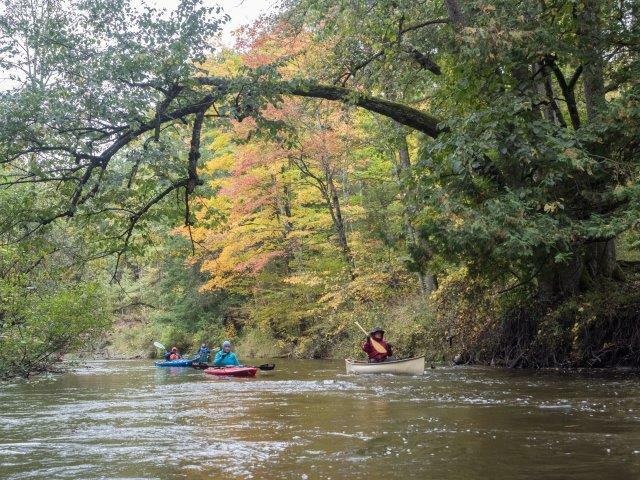 There were lots of discussions about the best boots for cool weather (40-50 degree temps) paddling. 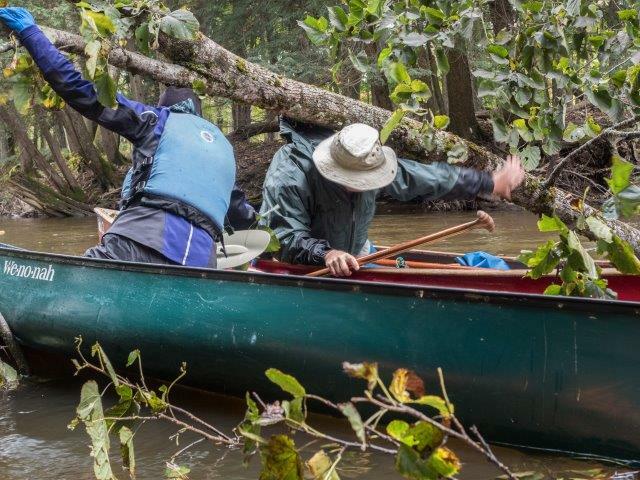 We encountered one newly fallen downed tree about three minutes after launching, but everyone made it through with some lumberjack work by John and assistance from Sara. 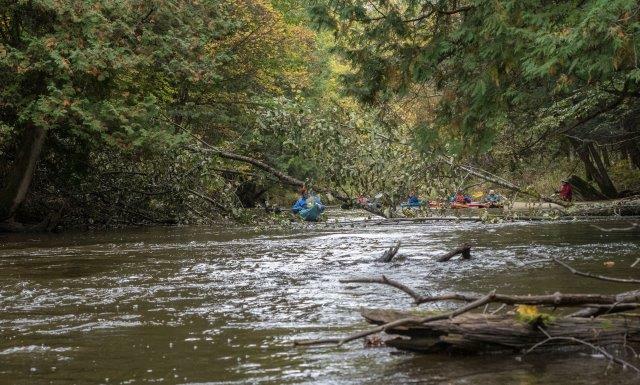 We had the river to ourselves, and it was nice to see that the efforts that we put into our river cleanups this summer have paid off. Trailers rock, especially at the end of the day. We had a multitude of trailers: John & I brought Babs & Greg, Jackie brought Glenn, Tracie & Terry, Doug brought Linda P, Sara brought Linnaea, while Marlene and Bob were each in their own cars. 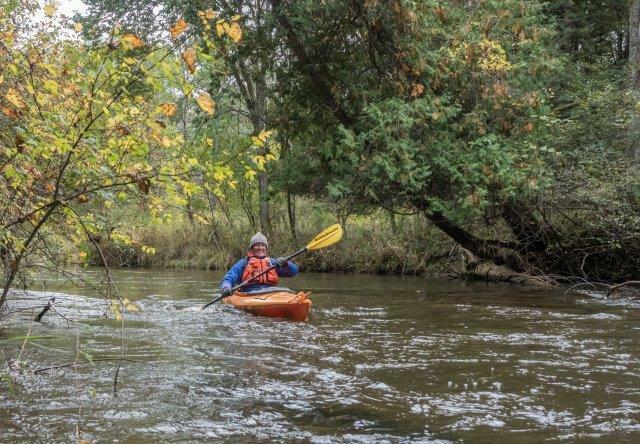 Marv kept everyone company while the shuttle was taking place, courtesy of Mark Miltner of Pine River Paddlesports Center. It was the first time this season that many of us were wearing long johns under our pants, along with a variety of synthetic tops, fleece, jackets, hats and gloves. Several people were coveting our hot tea at the lunch break at Elm Flats. Hint: When the temps are predicted to be in the low fifties as a high, bring a stainless steel thermos filled with hot water, and pour the water into a travel mug at lunchtime. Make your tea or hot chocolate then, and later you won't have to wash the thermos at all. Keeping the lid on the mug keeps your drink hot, and less prone to spillage. Additional hint: fill the thermos with boiling water the night before; then empty it in the morning and immediately fill it again with boiling water. 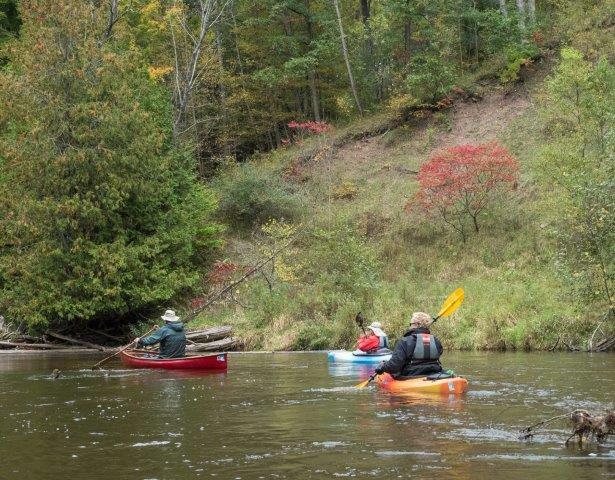 Fall paddling can be lots of fun, if you are prepared with experience, proper clothing and footwear, the right equipment and a great attitude, which everyone on this trip had. Thanks for coming! 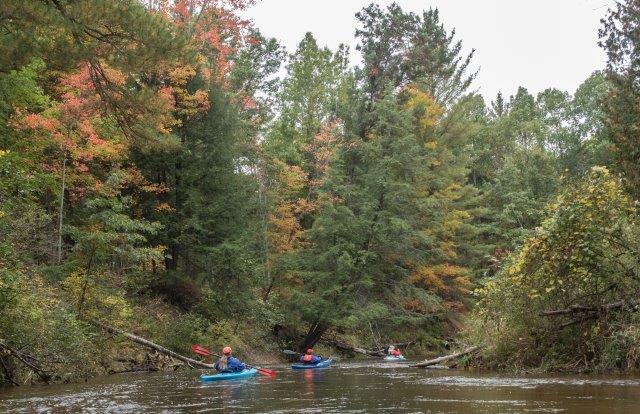 Fall paddling - colors in the trees as well as on the paddlers. Note that Bob has a hood on under his hat, after the wind blew it into the water. This tree was just below the surface; sometimes it was hard to concentrate on the obstacles whenwe just wanted to gaze at the views above us.